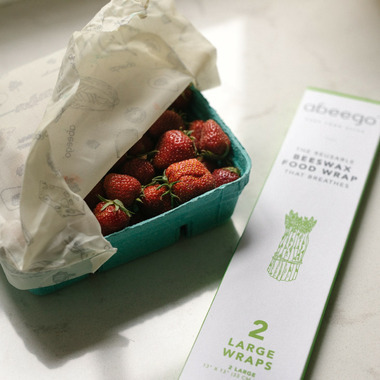 Made in Canada, Abeego is the original all natural beeswax food wrap that keeps food fresh longer. Abeego Saves Food by picking up where the peel leaves off. It protects and breathes like nature's peel and rind to preserve food longer than ever imagined. Abeego wraps last for over a year and are fully compostable at the end of their life. Abeego comes in a variety of sizes for all your food storage needs. Ideal for covering salad bowls, wrapping a sandwich, half cut avocados, herbs, cheese or loaves of French bread. Wrap: It’s self-adhesive so it takes any shape you can imagine. Squeeze Abeego around anything and everything. It’s like a handshake—the firmer, the better. Wash: Faithfully wash in COLD water, a little eco-friendly dish soap and a gentle cloth. Wash as required. (less is more) If it’s not soiled—fold and put away. Reuse: Multi-use and durable, Abeego lasts a year or longer with good care. How many times is that, you ask? Trust us, you’ll lose count. This product kept our baguette fresher for 2 extra days! Love that we don't need plastic wrap anymore! Good bye plastic wrap. This product is so useful and will stick to just about any surface. Easy to wash and I would recommend going with the large size or extra large as the smaller sizes are less useful. These are amazing! They get clingier, more malleable after a few uses. Bought a second set in different size. I feel good about using these wraps. I only use them to cover my bread mixture as it rises. I just cover and gently warm the edges with my hands so that it creates a bit of a seal on the edge of the ceramic bowl. Great! Love abeego wraps! This size I use for wrapping two sandwiches for hubbies lunch, or covering a mixing bowl, plus more! I would highly recommend these wraps. Environmentally friendly and you can use over and over. Keeps food fresh longer, especially cheese! Love love love these! They work perfectly and they are reusable- what else could you ask for! I believe they should be a staple in every household. They are easy to mold and they let your food breathe. They are also very easy to clean. Great product! I like these to wrap my cheese with. I still keep the cheese in the plastic wrapper so it does not pick up the taste of the wax. Prevents mold. Had previously order3d and used the 3 sizes. Wanted the large to use on my brick of parmesan. Works very well. Just wrap and put in fridge. ,over all sizes. Use for fruit etc. Great product! I ordered the large, medium and small food wrappers. I have yet to use the large size. I've used the medium size to wrap left over food in a glass Tupperware. It works fine, with a strong smell of beeswax. It does not affect the taste of the food. It does leave a film of beeswax on the glass, but nothing that won't scrub away with hand-washing in warm/hot water. The only downside is that I read on the box, that it will last one year or longer. It's quite pricey if it only last one year. Will have to see.